I wanted to chat with you about a wonderful book that I've read of late entitled Holy Rus: the Rebirth of Orthodoxy in the New Russia. It's written by John Burgess of the Pittsburgh Theological Seminary. He made a number of trips to Russia. He lived in Moscow and Saint Petersburg and made pilgrimages to a number of Russian Orthodoxy's most important monasteries, and parishes, and holy sites. And his latest book here, Burgess gives us a tour of the rebirth of Orthodoxy in the new Russia that's both fascinating and balanced. So I want to share some of his insights with you because I think it's a fantastic example of the kind of re-Christianization that's currently underway in a number of formerly Byzantine and Western nations. Burgess begins with a brief social and cultural landscape of Russian society prior to the 1917 October Revolution. It was a landscape dominated by the Russian Orthodox Church. 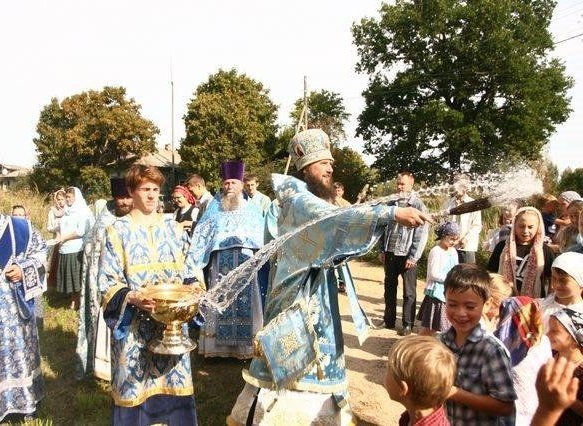 90% of the nation's population participated at least once a year in the Orthodox Church's sacraments. 50,000 parishes, 25,000 chapels, 1,000 monasteries, 60 seminaries, 4 theological academies covered the land. And sitting enthroned as the great benefactor and protector of the Church was the tsar in all of his glory and majesty. There was simply no other Orthodox nation that could even compare with Holy Rus. Now, Burgess notes that what happened after the Communist Revolution was simply unprecedented in Christian history. The Church suffered persecution on the scale the likes of which had just simply never been seen. By the end of Stalin's reign of terror, the Orthodox Church was virtually eliminated. I mean, you just, you have to let that hit you: What was once the most dominant social and cultural force in all of Russia had been reduced to mere rubble, very much like the tsar. Remember the 1,000 monasteries? Gone. They were all closed. Same with the theological schools. Only four bishops remained in office of the entire nation. And the 50,000 parishes were reduced to a mere few hundred. It's estimated that over 85% of clergy and monastics had been arrested and were consigned to die in work camps. As many as 300,000 people associated with the Church were killed. Now, one of the great ironies of history was the German invasion of the Soviet Union in 1941 that saved the Church from complete annihilation. One of the ways that Stalin and his generals tried to win popular support to take on Hitler was to allow some of these churches and monasteries to reopen. So by the end of the war, the Church had 15,000 parishes, 100 monasteries, and eight seminaries. The Khrushchev years, unfortunately, involved a renewed effort to enculturate the population in atheism, and the Church began to dwindle again to just about half the amount of churches, 16 monasteries, and just a couple of seminaries. Now, just to give you a window into the Russian heart: When the Soviet Union fell, it's astonishing that 30% of the population still openly referred to themselves as Russian Orthodox. Here's something even more amazing: After nearly 70 years of deliberate and dogmatic atheism taught in Soviet schools and universities, a survey taken shortly after the fall of the Soviet Union found that only 6% of the Russian population identified as atheist. That's 1% more than the global average. 70 years of deliberate, dogmatic atheistic education resulted in a 1% difference in atheism — a 1% difference from the global average. That's one of the most beautiful windows into the Russian soul that I can think of. Now, according to Burgess here, with the collapse of the Soviet Union, many Russians wanted to know what made Russia Russia, uniquely Russia. How was Russia different from Europe and other western nations? And more and more, it appeared that the Russian Orthodox Church had the answer to this question. The Russian Orthodox Church was, it's not merely. . . It's not merely a church; it symbolizes political identity, full blood and, indeed, national identity in that it sees itself as given by God the unique role to preserve the distinctively Eastern Orthodox vision of heaven on earth for all to see and then to participate in. And so, the Russian Orthodox Church sees its renewed mission as twofold: It would strive to invite all Russians into a personal faith and moral transformation on the one hand and provide the sense of national distinctiveness and destiny on the other. In short, as Burgess points out, Communism has indeed been replaced with Orthodoxy, and the results speak for themselves. Today, the Church has grown to 35,000 parishes, 800 monasteries, and innumerable welfare and education ministries spread throughout the nation. The most recent surveys corroborate that nearly 70% of the Russian population — 70%! — see themselves as either religious or very religious, and an astonishing 93% affirm their support and respect for the Russian Orthodox Church and Orthodox Christians. And astonishingly, a recent survey found that 30% of Russians would like to see a return to monarchical rule comparable to the tsars. Moreover, the Orthodox Church has even made its way into domestic political policy in something called Spiritual Security. Burgess doesn't really get too much into this, but I happen to think it's important here. Spiritual security is considered a subset of national security, and a number of policy documents issued by President Putin's administration . . . It's designed as a primary measure by which traditional Russian values, embodied particularly in the Russian Orthodox Church, can be protected and perpetuated in the midst of globalized assaults. It's fully recognized by Russian officials that globalization involves radically detraditionalizing forces that dis-embed time and space away from localized and customary interpretation control and re-embeds them in trans-national consumer-based interpretation. So localized time is replaced by standardized time; localized business is replaced by trans-national corporations; and localized customs are replaced by trans-local, media-driven events. And the Russian policy of spiritual security is taking very seriously the secular detraditionalizing forces of globalization. So, in 2000, the national security concept of Russia stated that the assurance of the Russian Federation's national security included protecting the nation's cultural, spiritual, and moral legacy and the historical traditions and standards of public life. There has to be a state policy that maintains the population's spiritual and moral welfare. Did you hear that? There has to be a state policy that maintains the population's spiritual and moral welfare. And so, Vladimir Putin has drawn a very tight connection between religion, culture, and nationality, so much so that, back in 2002, the then-Moscow Patriarch, Alexei II, consecrated an Orthodox Church right on the grounds of the Lubyanka Headquarters of the Federal Security Agency. That was . . . That's formerly known as the KGB! And the key here was the symbolic gesture bringing together Church and State in maintaining the distinctively Christian identity of Russia, which, by the way, John Burgess does, certainly, get into in his book here. The Patriarch made it very clear that the ceremony solidified the joint effort between the departments of the government and the Russian Orthodox Church to maintain the spiritual security of the Russian population. The result is that Russia — it is one of the leading nations in the process of re-Christianization that's currently going on, that we see in nations such as Poland, Hungary, Slovakia, Moldova, Bulgaria, Georgia, and, yes, even the Pacific Islands of Samoa. I think Russia is nothing short of a miracle blessed by God to bear witness to the world — the dawning of the revitalization of Christian civilization that will be going on more and more throughout the West as more and more nations turn away from the dying and wilting secular globalization and back towards the resurgence of Christian faith, culture, and civilization.